WunderHaus is a farm-to-table restaurant located in the heart of Conway, Arkansas. This European-style restaurant serves up some of the most creative dishes — and one of the coolest things about it is, the menu changes daily. I had the privilege to sit down with one of the restaurant’s owners, Auguste Forrester. Forrester and his sister, Jacqueline Smith, are the geniuses behind these exquisite dishes. WunderHaus produces foods from various regions ranging from Russia, Poland, France, etc. The restaurant creates dishes for whatever the ingredients allow for, Forrester said. He said no one can rely on the menu to be the same every day. “Some days it is going to change. By the end of say, a season, it will be a completely different menu than it was a month or two ago. And, we hold onto a lot of our menus, not just for sentimental sake but to also keep a record of what we’ve done and what people liked,” he said. As I entered the gas-station-turned-restaurant, I immediately felt comfortable. I made my way up to the bar and asked the bartender what kind of beer he recommended. He suggested an Ayinger beer. It was a great choice to begin my meal. The beer was light and slightly citrusy. It didn’t immediately fill me up before my lunch. After reviewing the menu for 15-20 minutes (because everything sounded delicious), I chose to try the Vlad Poutine. I’ve never had poutine but have heard wonderful things about it. Once I took my first bite, it immediately became one of my new favorites. 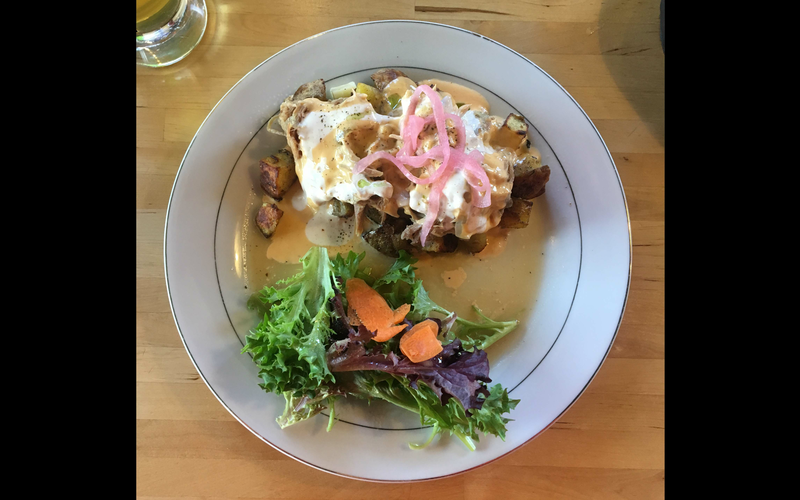 This dish consisted of roasted potatoes topped with a beer cheese sauce, onion gravy, braised pork shoulder and pickled red onions — wow, was it perfect. The potatoes were crispy yet soft. The cheese sauce and gravy fit together with rich flavor. The pork shoulder was especially tender. The pickled red onions were the cherry on top – as they were tangy and crunchy. Every bite practically dissolved in my mouth. My taste buds were having a party. Forrester told me it’s important to figure out what flavor combinations work together, even if certain ingredients seem an interesting fit. 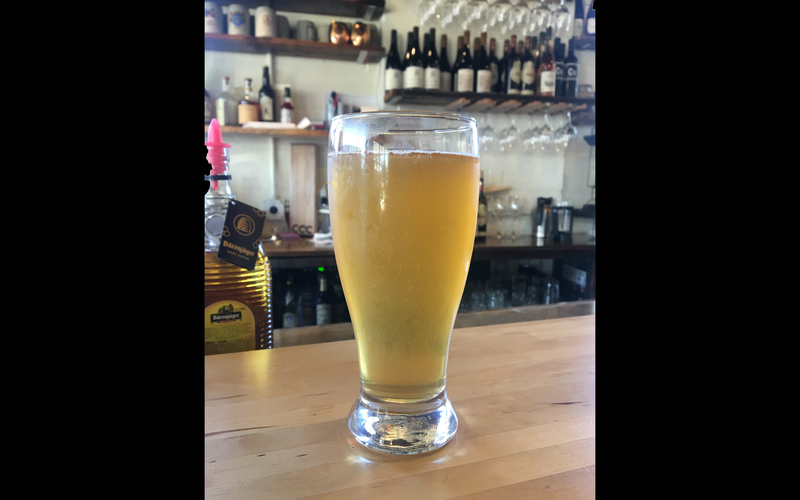 WunderHaus is extremely loyal to Stone’s Throw Brewing and local farmers. “I think that the biggest thing we want to get out there is before we are anything, we are farm-to-table. If we can’t use local ingredients, then we’ll shut the doors down,” Forrester said. He said the restaurant started out as a food truck, the WunderBus, and used to park at Stone’s Throw Brewing in Little Rock. Forrester said he and his sister have no formal training in the food industry. He said Smith is the creative mind in the kitchen. She comes up with the menus, the dishes and the creative aspect of everything. “I feel like our real training was in the food truck – maybe not for her, but it certainly was for me. Because you have limited space [and] limited ingredients, you’re forced to come up with a dish that will work. And you never know what kind of taste you’re going to end up with,” Forrester said. Forrester loves people and he is passionate about establishing a family at WunderHaus. While sitting with him I noticed every person that walked by or came up to visit with him, as he and his team are entrenched in their community. “My favorite part about this restaurant is the people. There are so many people that I would’ve never had the opportunity to meet in any other circumstance […] My favorite type of story is a true story. I collect stories. When you really listen to somebody, you can gain a whole lot of empathy,” he said. WunderHaus is located on 900 Locust Avenue in Conway, Arkansas. They are open Tuesday – Friday from 11 a.m. to 2:30 p.m. and Friday – Saturday from 5:30 to 9 p.m. Stay up-to-date with their latest dishes on social media.